Kids love to collect keychains and your lion-lovin', keychain-collectin' child will be excited to add this adorable little plush lion keychain to his or her collection. Cute and cuddly from every angle, this lion stuffed animal keychain is sure to delight with its soft bright yellow fur, white accents, embroidered orange nose, and fun loopy purple mane. And there are no worries about for your new pet scratching the furniture as this little lion is perfectly content to simply lie on its tummy or sit up and watch you when it's not adventuring with you on your backpack, purse, belt loop, or simply looped around your finger. Having a zoo-themed party or is your team mascot a lion? 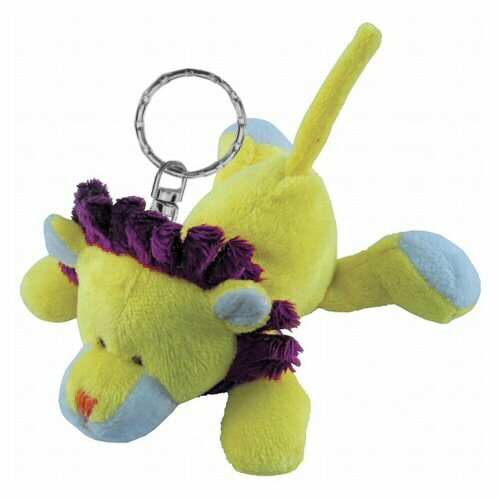 Lion plush keychains are also great for birthday treat bags, prizes, and giveaways! Famous Lions: I'll bet when you think of famous lions, two characters come to mind pretty quickly... Aslan of Narnia and The Cowardly Lion from The Wizard of Oz. They are classic characters for sure!